While I am just as curious about looking at the insides of things, my passions have changed somewhat. The reserves of energy I used to devote to thinking about and memorizing facts about Star Wars, I now channel into clothes and shoes. What follows is a look inside the inner working of your favorite shoes and boots, a chance to take a more detailed look at the remarkable craftsmanship that you stick your sweaty feet in every day. And unfortunately unlike the famous DK book, your chances of spying Chewbacca in these images are significantly reduced. Some gentleman with very tiny feet must have been horrified to see his shoes cut in half. But at least he got an educational glimpse at the inner workings of New England’s finest. Educate yourself on Alden’s historical inner workings in our brand profile. Allen-Edmonds Cross-Section. Image via The World of Shoes. The first nice boot I ever owned, you can see why Chippewa occupies a somewhat lower tier in the world of shoes and boots. They rely heavily on foam to pad the insole of their shoe, instead of using other higher-quality materials. See what else was up for grabs in the give and take in our review. Calfskin Blucher Cross-Section. Image via Heddels. These Grant Stone bluchers have nothing to hide, except for cowhide! See all about why in our review. Helm Boots Cross-Section. Image via Helm. L.L. Bean Engineer Boot. Image via Heddels. As with the Chippewa Service Boot, the Engineer Boot reveals its true colors when cut open. You can see a surprising amount of non-leather (i.e. synthetic) materials. Yet another reason this boot lives in our entry tier, read about why in our review. How’d that get there? Image via Silodrome. Wait a minute. That’s no shoe… It’s a space station! Rancourt Cross-Section. Image via Rancourt. 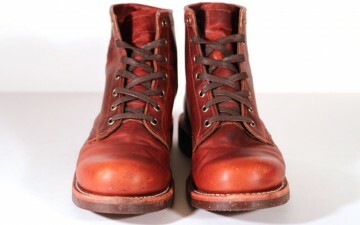 Red Wing is perhaps the most ubiquitous of the boot brands we cover. Red Wing occupies that financial sweet spot where cost meets quality in a perfect way. Because there are more Red Wings in circulation, there are also more cross-sections (as no one wants to cut up a thousand dollar pair of boots). The cross section above is from an exhaustive boot review by Lithic Goods. Check that out for even more boot info. Red Wing Moc Toe Cross-Section. Image via Red Wing Heritage. The insole/midsole/outsole trifecta in these Red Wing Moc Toes are surprisingly and elegantly streamlined. Too bad you can’t normally see them. Red Wing Iron Ranger cross section. And this cut is from our own extensive review of the Iron Ranger, the victor in our Entry Level Goodyear Welted Showdown. Shoepassion Cross-Section. Image via Clutch. Thank god for cross sections! How else would we have known just how fuzzy these boots were? The logical final step for UGG lovers the world over. Thorogood Cross-Section. Image via Heddels. The sturdy interior of one of the most affordable boots in this collection, these Thorogoods mean business as the runner up for our best entry level boot. Viberg Boot. Image via Viberg. As with all things, Viberg excels even in their cross-section. You can see not only the attention to detail present in Vibergs, but also the sheer indestructibility of the product as well. The lug sole, the steel toe, the urethane heel wedge, everything adds up to make an incredibly well-assembled boot. White’s Boots cross section. Image via Rakuten. Besides the fact that White’s comes last in the alphabet in our list, the boot makes sense as a concluding cross-section. Just look at that beefy double leather sole, our collective hearts weep for both the ruined boot and the saw that was forced to eat all that hide.